This is an especially insightful spiritual Reflection by Rev. Chava Redonnet of the Oscar Romero Community in Rochester New York. Amen to her words of wisdom. The hymn she discusses, written in both English and Spanish, was also the offertory hymn at my Ordination to the priesthood on 7/20/2015 along with Gloria Carpeneto of Maryland and Gabriella Velardi Ward of Staten Island, New York as Priests and Mary Ann McCarthy Schoettly, Deacon. As I recall, the choice of that hymn was unanimous and its meaning special to all there. From that time on Mary Ann became a loving supporter of our Good Shepherd Ministry to the homeless. Her Sophia Community in New Jersey continues their generous support of our ministry as well as Rev. 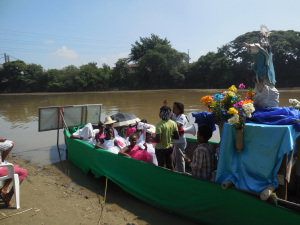 Chava’s ministry to the migrants. i join Chava in thankfulness for the life of Rev. Mary Ann Schoettly who left these shores too early to join that great cloud of witnesses on the other shore surrounding us with love. at your side,I will seek other shores”. by Cesareo Gabarain, Published by OCP, 1979,1987.
how important that song would be in my ministry just a few years later. someone who simply says, take me and use me, Lord. I was hearing her story. In the back part, I was trying to pray for her. But the prayer wouldn’t come. It was like it was stuck. “Huh,” I wondered. “Why can’t I pray?” Then I realized that it was because I was praying down. The good news is, once you’ve had a moment like that, it’s hard to go back. look at the magnificent view. I suspect that’s liberation. us wanted, but it sure was prophetic! Keep warm and drive safely in all that snow!